The research unit KERMIT (Knowledge-based Systems) adopts a holistic view on mathematical and computational modelling, acknowledging the needs of our modern information society with a particular focus on the applied biological sciences. It strives to keep a unique balance between theoretical developments and practical applications, a strategy that has proven particularly successful, regarding the output, visibility and recognitions of the team. It plays a pioneering role by promoting existing as well as developing new methods in a broad range of disciplines shown below. We are looking for a PhD student for the topic “Mathematical modelling of adaptation and acclimation in marine ecosystems”. The PhD scholarship is available in the field of spatio-temporal modelling under the supervision of Prof. Bernard De Baets, Prof. Jan Baetens and Dr. Aisling Daly. This topic is part of an interdisciplinary project (REACT) focusing on understanding how global change alters marine ecosystems and the services they provide. The student will develop and analyze spatio-temporal models to unravel the potential of marine organisms and communities to acclimate, adapt and/or disperse, and to retain ecological functioning under different climate scenarios. More details, and instructions on how to apply, can be found here. 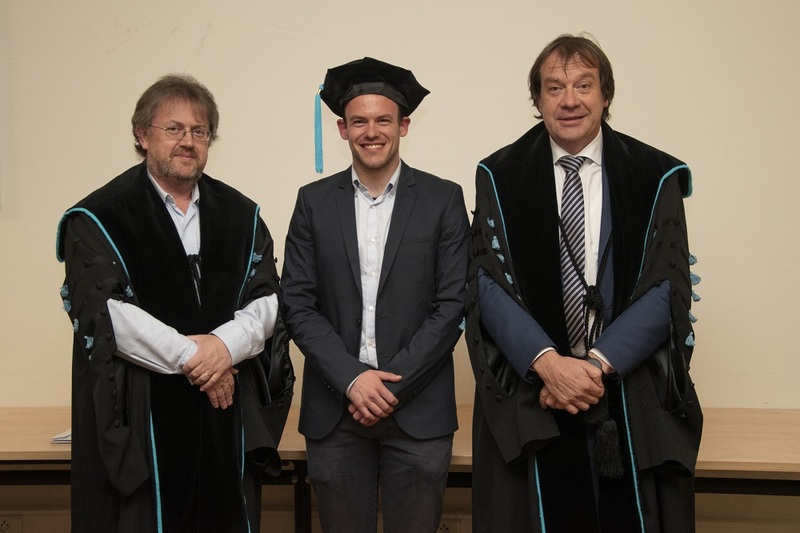 On March 29, 2019, Elias Van de Vijver successfully defended his Ph.D. thesis "Development of IPM tools for the management of Oulema beetles in winter wheat (Triticum aestivum L.)" and was awarded the title of Doctor of Applied Biological Sciences. Elias was supervised by Geert Haesaert, Bernard De Baets and Guy Smagghe. On March 27, 2019, Hang Zhan was awarded the title of Doctor of Mathematics for his Ph.D. thesis "Cross-migrativity and modularity of binary operations in the context of the study of uninorms" by Shandong University, China. Hang was supervised by Hua-Wen Liu and Bernard De Baets. (2019) COMPUTER METHODS IN BIOMECHANICS AND BIOMEDICAL ENGINEERING. 22, 64-70. (2019) JOURNAL OF SENSORY STUDIES. 34, e12471. (2019) DATA MINING AND KNOWLEDGE DISCOVERY. 33, 293-324.